Open sorce laser sintering with heated build chamber and piston. Greetings, during the last year I have started to design a SLS 3D printer that could be built by everyone with "limited tools" for about 2k, so the goal I set for myself was very similar to what the Reprap project stands for. As I have taken a lot from this great community (the first 3d printer I have built was a Reprap) I thought that in the following moths I can give something back. I have actually worked hard on this project which for now is not more than a few files on my hard drive, and really just wanted to get your thoughts about this design. I am sorry I can’t release all the files just now, as I need a basis for my indiegogo campaign but I can assure you that I will publish them later on. Edited 1 time(s). Last edit at 04/01/2015 05:30PM by Lukas Hoppe. 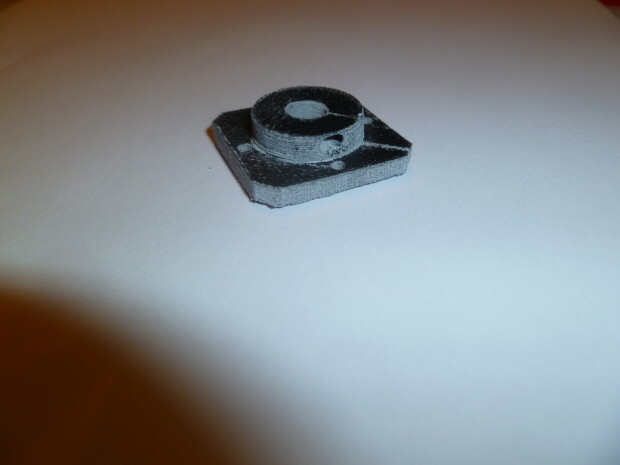 Re: Open sorce laser sintering with heated build chamber and piston. Very nice project! I would love to build an SLS machine myself, but I have yet to finish my Kossel Mini printer and just read a little. I like the design, thanks for sharing your progress on instructables! Separating electronics and gantry from the hot and messy powder bin seems like a good idea. But does the laser just pass through the glass? I guess this also depends on the wavelength. Is that why you chose 445nm wavelength? (Instead of an IR laser). Long term a X/Y gantry might be cool in order to add a second inkjet print head to colorize powder before sintering it. But that is a long way off of course. Or maybe not! Do you plan to use a CoreXY gantry? I guess cheapest would be to use openbeam with delrin wheels, or maybe better makerslide with specialized beams. What CAD software did you use? BTW if someone contributes a little $10 to your cause and it doesn't get funded, will you still get early access? Of course one will still get access to all the files, as they exist anyhow. Also if I don’t get all the funds, I will still work on this project as I am very interested in having such a printer myself, and I also feel like that having a platform on which you can base future SLS 3d printers would be cool and appreciated. I was indeed planning to use a visible laser, in fact I have already one sitting on the desk in front of me. Therefore the glass should not be too much of an obstacle as the laser remains in a constant 90 degree angle to the sheet of glass. And as the laser diode I am intending to use delivers as much as 2 watts, there is plenty of power. As far as the X/Y gantry goes, I was actually planning on using the standard 8mm linear motion hardware that Repraps use, because I was aiming for parts that are openly available from dozens of companies. I have also looked at openbeam and really like their system, so maybe a later version of the design files will have an alternative X/Y gantry system at its deposal. As I am soon to be done with my finals, I will have a lot of time to work on this project and hopefully get it work. The inkjet idea is really interesting, and I would love to investigate that further when SLS is working. If you are interested in ink jet printing I suggest you check out the “Plan B” printer. Thanks a lot for the interest and should more questions come up, just keep asking. Edited 1 time(s). Last edit at 04/04/2015 06:43AM by Lukas Hoppe. What model laser diode did you get? I researched a bit and made a small list in the other thread about laser wavelength. About the gantry... have you thought how much space between the window and the print bed? For the laser focus it would be best / easiest for it to be as low as possible. But where would you put the surface heater then? Do you plan on using some kind of IR heater? IR diodes? If the window is close then you'd have to angle the heating elements rather shallow and wouldn't get even heating. TBH I have no clue how the surface heater would work. If you use an IR thermometer (like this one) wouldn't the IR output of the surface heaters totally confuse the sensor? How would you keep the reflected IR light from entering the upper chamber through the glass? Is it opaque to far infrared? Or do you just increase the cooling for the upper chamber? Well, as I have to admit I am not an expert on lasers, so I just got a relatively cheap module that uses this 450B 1,6W 450nm laser diode and came with a collimator and a 2 amp laser driver that supports TTL (which is not really required, as you can simply PWM the whole driver. The picture frame idea is really clever, I will keep that in mind. Well the gantry leaves a relatively small space between the diode and the window, yet the window is quite far away from the actual print bed. That should not be too much of a focusing problem I guess, as professional machines have to have a big distance there too, because they use galvo scanners. Oh interesting. Yeah quartz-halogen heating lamps definitely seem the way to go. 24€ for a 1200W heater! Aluminium seems to be a good reflector for IR. Gold is the best one - I guess that is why they use it to coat FIR laser mirrors. You could use a polished aluminium sheet to form an effective reflector for the print surface. If you could calculate the right shape for the reflector you could distribute the heat evenly across the print surface from a low angle. Not sure how important an even heat distribution is but if you get cold spots the material might not sinter properly and at hot spots you might get backed nylon powder. BTW what are the advantages of glass filled nylon 12? Is it just filler material to make it cheaper and more recyclable? I guess it also improves strength if you look at the datasheet and that it might hold up better to temperature. But does it sinter better or worse for our purposes? You are right, even heat distribution is definitely something you want. I just thought it would be good enough If I simply mounted these bulbs high enough, the sintratec uses a very similar system, from what I saw in the video. I thought it would be about time to update, as I have finally printed the first useful objects with you-sls. Because I haven’t installed the piston heater, I could only use the optical heating system and therefore needed to adhere the object to the build plate. But for a first and second print I am pretty pleased. A big thank you to everybody who donated to the project! You guys made all of this possible! Edited 1 time(s). Last edit at 08/31/2015 06:36AM by Lukas Hoppe. About halogen lamps - I use a halogen lamp for pigment-based selective fusing (also known as High Speed Sintering) in my BrundleFab project. My powder bed printer's layer head (for lack of a better word) used a halogen lamp with an aluminum heat shield over it. While developing the sheet metal, I made the decision to fold down, instead of cut out, the sheet metal in the area where the halogen lamp was to be, thinking I could use the flaps to provide shade from the halogen, to get a better linear heating effect. Boy, was that a mistake! In my 'fused' layer, I got caramel globs, but no sintering, on the layer. After disassembling the layer head, I found the (interesting) answer: When the halogen is powered on, the light chamber shields became incredibly hot (> 300C) and since they were only 3mm away from the powder, they easily contact-fused and caramelized some high granules..
As the grains of powder caramelized on the shields, they made caramel drips. These drips then oozed down to the layer, and picked up more sugar (both inked and uninked, leaving a streaky mess) and made even larger globs of caramel on the shields. I'm working on some mechanical redesign that will move the aluminum shields further away from the powder. I suspect there might have been some sort of electrostatic effect involved, but I have no proof of it. Yeah, even heating was the biggest challenge, or maybe even still is the biggest challenge on my printer. I think that the bigger the distance between the lamp and the powder the easier it is to heat it up evenly. So I was also quite angry with myself that I did not leave 5 more centimeters, I could luckily get away with just two pieces of aluminum foil that I folded to act as a flap to direct the light. I don’t really know about the electrostatics, but it seems unlikely when using normal granular sugar. BTW: does the process take place in a heated environment? Or are you adhering the first layer down to a build plate? If not, how do you get your layers to “not warp”? Granulated sugar is a very forgiving build material - I don't have any warping issues yet, at my 1mm layer height. I don't have a heated build chamber - I just heat the top surface. Sugar retains heat quite well, and once the top layer is up to temp, retains its heat for quite a while. This is neither a good nor bad situation for me, merely observed behavior. My first layer is printed right on top of unheated granulated sugar, then the halogen lamp pass heats the pigmented area faster than the unpigmented area, and sinters it. I still have a _ton_ of calibration work to do: halogen fuser speed, optimum lamp distance from the bed, effects of preheating the layer before fusing, spray density (evaporation heat loss vs. darker surface to heat faster), etc. before I call my project 'working'. WOW congratulations Lukas! That are some very nice first print results. Well done! I didn't follow your project for a while. There is a lot of news to catch up to. Do you have a different place where you discuss the project? (not that I'm suggesting that, this forum is great, just wondering). Why is the light flickering like that? Is that a feedback response to IR temperature measuring? I've suggested it before but calculating the right shape for a reflector might help so the surface is heated evenly. But maybe that is not needed after all. I'm also surprised that the nylon is white but becomes so black after sintering. Is it "charred"? How well does the white absorb the blue laser? Are others already building a You-SLS as well? I've ordered a laser diode and driver and stuff a while back but haven't "played" with it yet. I did check out the plans for the you-sls but the whole specially cut aluminium parts put me off a bit. The whole structural thing of the powder bins etc are quite complex with SLS printing. EDIT: You should definitely put up a donate button EDIT2: Oh I see you can still donate via indiegogo. And BrundleFab sounds like a very cool project as well! Edited 3 time(s). Last edit at 08/31/2015 03:13PM by Dejay. That sounds really promising, I also want to try powder on my printer in the near future. It could make a very cheap printing material! Btw. Where are you going with the brundleFab? Do you see it printing polymers too? I think high-speed sintering could be the next big thing. Especially if you can get away without other means of preheating! I just watched a video from the university of Sheffield, it looks like they can print nylon without heating. Very interesting! Thank you very much, Dejay! Yeah, that flickering comes from the IR thermos-sensor feedback. So far the program that controls the temperature is not very advanced and I will replace it by something more appropriate but It works fine for testing. I have actually build a very crude reflector flap thingy (from aluminum foil) that helps evening out the heat distribution but this could be improved by a mile. But like you said, I really hope we can get away with the current setup. 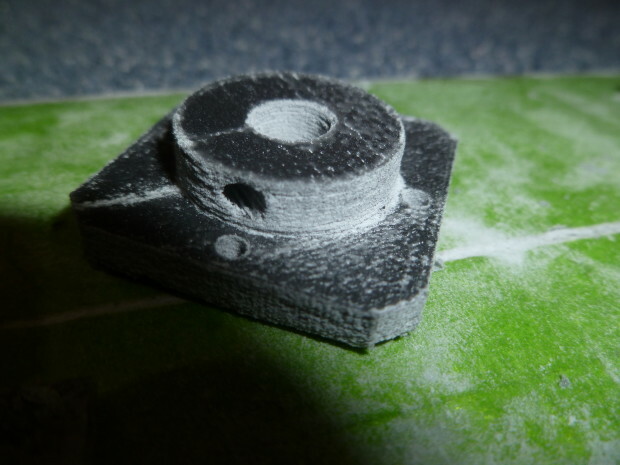 As the laser was scanning the area with 100% infill it turned the nylon pretty dark by itself. Then the darker cross section actually absorbed more light and partially melted again only by the halogen lamps. I think in this image you can see the “scars” left by the laser (with way too much power) , and also area that was molten by the lamps. I hope this makes sense… maybe we could even use this in a combined sintering/highspeed sintering printer, even though I don’t really see why it would be helpful. Never mind! Actually a very nice Chinese guy is also about to finish a highly modified version of you-sls with a proper roller mechanism. It will be interesting to see if that actually makes a practical difference. As for others I would defiantly wait one more month, there are a number of modifications to be done, and I am currently working on a new CAD model. The newer iteration will be a lot easier to assemble and also more energy efficient as well. I do see how the aluminum parts put one of, but I doubt there is a more economical way to do this if you want to heat the chamber. Going without heating could also be worth an investigation! Sharebot seems to have it working, so why not try it. About the white / black powder: I shot VDX a pm and he said that it looks like charred nylon. I did read up on your blog so I saw that you did add carbon powder. I think dark nylon would definitely be a good way if you can get it. You ordered WHITE nylon from rpsupport, right? Controlling and modulating the laser power according to the surface temperature below the laser and the speed would seem to be important so that the laser power can be adjusted. How do you measure the surface temperature? Do you use a thermopile like in this instructable? Have you written somewhere how that works? And is that not yet in the BOM list or is it the REX C100 PID controller? EDIT: Oh I see the PID controller control the halogen lamps. I guess it outputs variable DC voltage or something. I'll have to read up on that. Is the IR sensor fixed to the print head and moving with it? I'm still wondering about the rapid change. Ideally you'd want the whole surface area evenly heated. Does the rapid change from the heater lamps come from the moving IR sensor? Or just PID control? I still wonder why you didn't go with a CoreXY gantry. It should allow for faster movement of the laser (no heavy stepper motor on Y axis) and only two stepper motors for X/Y. Is there a reason why you chose this design? Or just convenience / opportunity / not familiar with coreXY? After all is tuned in the speed or acceleration of the laser would seem to be an important limiting factor. It might be possible to make the whole laser head lighter than a hotend too. Sorry for the many questions Again, awesome job! The problem with adding carbon (I got black pigment from an art-shop) is that it worsens the flow characteristics of the nylon. So if you put too much of it in, it’s not distributed well by the very simple powder spreader of the current design. The problem actually is the placing of the IR sensor (it’s a MLX90614). You can’t attach it to the print head, because it would only return the temperature of the glass sheet, so I had to mount it in a remote location over the supply piston. Then I am simply assuming that the temperature is perfectly even (I know it’s not, but…you have to compromise somewhere). Then I did a test and heated the printer up so much that the powder on the build piston started to melt. According to the datasheet of my material, that was 180c so I knew my max temperature. Then I took acouple degree off of that and set it as temperature. The temperature controller then turns on the lamps until the temperature is reached. If it’s below it turns the heater back on (with a little bit of a debounce delay). It simply controlled by a solid state relay. That explains the fancy disco lighting. There really is no intelligence wasted on my part: D the simplest solution possible. But astonishingly it works well enough for testing. As far as source files go the step files (I should have uploaded these) should also be usable for now. But you are right, I will upload the files for free cad, when I am done with my big design revision. I guess ultimately you'd want the IR sensor to only "see" the heat bed (but then again any screen or vignette you'd put in front of the sensor would also have a IR emission). And have the halogen lamps shine evenly only on the heat bed. Like I suggested earlier if you could photograph the standard pattern of the radiance of the light bulb you might be able to generate a shape for the reflector that evens everything out perfectly. But maybe that is overthinking it. Plus every light bulb might have tolerances that change this pattern. BTW what halogen bulb do you use? Is it the same type of lamps used in this halogen heater for example? Another thing I wanted to ask... what is the approximate price range for the laser cut parts? Of course there is really nothing wrong with getting these made but it's a bit against the reprap idea. Nothing wrong with that either of course. What I meant with my previous comment is that I just have no experience with ordering custom made parts so it feels a bit risky (like you wrote you had to sand a bit because of tolerances but ultimately no problem). I wanted to mention another idea for the gantry. But it's probably not a practical idea really. I've been thinking what the functional equivalent to a three axis delta bot in two axis is. A parallel robot with two axis could simply be two opposing linear motion axis with arms attached to the center. Now delta bots at least had the reputation to be faster than X/Y printers because of the lower mass to move but not sure if that even holds anymore if you use a CoreXY. So it's probably not a relevant or practical idea (because you'd need more complex kinematics + end stops + calibration) but I still wanted to mention it for some know-it-all reason. Sorry for asking so many questions. I hope I don't keep you from actually working on the SLS printer!